So today (yesterday by the time you read this) I got stung by believing something that was false. I jumped on a guy who downplayed my complaint about the Roman Catholic practice of enforcing celibacy on their clergy, when Scripture says those “clergy” should be the husband of one wife. When he said it was unimportant, I brought up the recent scandal in the RCC with priests and children. In my mind, enforced celibacy was related to a high occurrence of child molestation. It’s not. Someone said that correlation is not causation, which I am well aware of. Somehow, though, I got it in my mind that this issue was a settled, firm case. So I looked it up. It’s not. Not only is there no causation, there is no correlation. It was really embarrassing. I jumped all over that commenter because I was offended. Had I been correct, I would have been rightly offended. I wasn’t, though, so I was just really rude. Now I’m going to use this mistake to jump subjects entirely. Being wrong like that brought back unpleasant memories of another experience I had 20 years ago. In 1995, I watched 3 episodes of a creationist show put on by the Creation museum. They told me they were equipping me for battling the evilutionists who were being used by satan to get us to quit believing Genesis and thus throwing doubt on all of Scripture. I should have been more on my toes. In the late 1980’s, I had read a book, put out by InterVarsity Press and written by three scientists who were Christians, that complained about the dishonesty in the creationist movement. I didn’t pay much attention because I had such a hard time believing that Christians, especially leading, in-the-public-eye Christians, would be purposefully dishonest. I was new to the internet then. I was only familiar with CompuServe. I knew of people who had been “out there.” They had gone into the World-Wide Web, and they had returned unscathed. I limited myself to the CompuServe religious forum, where I used my knowledge of the early Christians to take on all comers in debate. I’m good at debating, I gained bit of a following, and I took way too much pride in considering the CompuServe Religion Forum my own private domain. A pack of evilutionists showed up in “my” CompuServe forum. No problem. I was prepared. I had seen three TV shows done by the Creation Museum. I immediately pulled out my favorite weapon from my extensive, 3-hour training history: “Lucy,” the supposed ape-human link. Borrowing information from the program, I “proved” Donald Johanson, the discoverer of Lucy, to be a fraudulent and deceitful man. They gave me a link that sent me out into the world of the internet for the first time. There I read an article exposing the shameful misconduct of Christians in fabricating the slander against Dr. Johanson. I was every bit as horrified then as I was horrified today to have so boldly and harshly defended a false rumor. That makes today worse. I made a commitment 20 years ago to do proper research. I would never just trust what I heard. I would make sure there were good sources for what I said. And if there weren’t? Well, the Creation Museum had taught me not to trust even prominent Christians, so I wasn’t going to believe what did not have good evidence. The only word I would just accept is God’s. When Ben called me on the Roman Catholic issue I mentioned, I knew what to do. I had to find out if anyone had checked on whether celibacy had anything to do with causing pedophilia. I’ve learned over the years that anti-evolutionists don’t like research much. They prefer to ask questions and leave them unanswered. “What if” and “maybe” are two of the most preferred answers to questions in the creationist movement. I don’t like to leave things there; leaves too much room for lying, er … dishonesty. So I looked up Ben’s suggestion. I’m not going to leave things at “maybe”; not if I don’t have to. The results were pretty painful. Crow is hard to swallow. I was wishing I’d done the research before I wrote. Still, I thought I’d try to rescue something useful from the incident. This entry was posted in Evolution and tagged Evolution, honesty. Bookmark the permalink. I really like this blog. Sorry I’m so slow replying on the other thread. I have a lot of respect for Paul, and I enjoy reading his blog very much, but I hope you stick around, because you also seem able to bring a depth of knowledge to discussions that we can all benefit from. Thanks, Ben. I have to suppose that the most prominent thing we have in common is tolerance for each other’s tirades. Actually, I won’t call any of yours “tirades.” You’ve only been guilty of persistence, a very small charge and one for which you apologized anyway. I really like all the parts where I look good, and I don’t like the part where I look bad. I keep supplicating our Father for perfect discernment and he keeps ignoring me. Ah! Intellectual integrity! A rare speciman. Thank you for posting that and I’m glad I was introduced to this blog. For young people there is a terrific website called “theauthoroflife.org”. It is about encouraging students to think about the relationship between their belief in the God of the Bible and the process of evolution. Please view the seven videos. Quite beautiful representations of God’s creative process. So, does that mean you believe in evolution (now)? (I ask this of both Paul and Ruth). Okay, I have to add this. George MacDonald would have been on my side, too, I’m pretty sure, while also not being on my side. He didn’t want to talk about it. He chose a different tact, which dodges the issue but which I nonetheless admire. He said that scientists miss God because they are studying God’s footprints, thus they have their back to him. Apparently George thought we ought to be following God around, not examining his footsteps. Though I heartily disagree with him on universalism, I’m a huge fan of George MacDonald and his general attitude to God, faith, and life. Well … we’re in hearty agreement on something at least! Most significantly, perhaps, I share all that “we need to submit to the King, entrust all our wealth and everything else to God, live in fellowship with each other, grow in holiness through the Holy Spirit” etc. thing. It pains me that the Catholic Church has such deep and profound descriptions of having a close relationship with God and with each other, but fails, by and large, to make that into a lived reality. We differ in our judgments of Christians who are living outwardly Christian lives without the full inward experience, but not in the value of working to achieve the goal of all Christians being brought fully into that life. That’s a pretty great thing to be in agreement on. Did C.S. Lewis say something specific about it? It sounds like him, but I don’t remember coming across it. As for me… well, it’s always a good excuse to post a link to an article I wrote, right? 😉 Theological Reasons for Evolution. Debates so often focus on “scientific reasons for evolution” vs “theological reasons for creationism” that I don’t think we realize there can be theological reasons for evolution, too. Wow. I deleted my own reply. I realize there are theological reasons for evolution. I don’t think I could have accepted the scientific evidence for evolution without some theological things that drove me in that direction. Oddly enough, most of that came from the early Christians, who obviously never heard any scientific evidence for evolution. I’ll bookmark your link for later reading. The CS Lewis reference is from The Problem of Pain, and you can read it on my web page here: http://www.proof-of-evolution.com/evolution-of-man.html — It’s in the last green quote box towards the bottom of the page. Okay, it’s out. I have a whole web site defending evolution that I haven’t really kept up since I was in the hospital with leukemia. I’ve not kept that secret. It just rarely comes up. My article isn’t too long. When you have time to read it, if you have any feedback, I’d appreciate hearing it. The “waters above” puzzled me from the first time I read it. I knew the universe is billions of light years across, so where would one find “waters above” the sun, moon, and stars? It’s a great verse expressed figuratively with lots of room for revelation, especially if the waters below can prepresent people. I have Augustine’s On the Literal Meaning of Genesis, and his literal is definitely what we would call figurative. I have to wonder what his figurative interpretation would be! 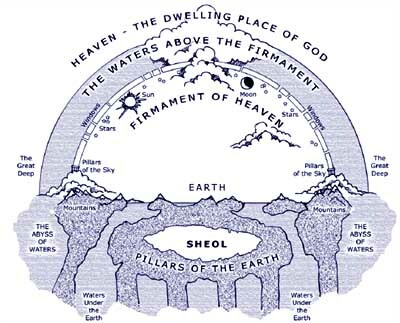 I was in… junior high or 9th grade when we studied Genesis, and the teacher gave us a drawing of what the Jewish conception of the world looked like, with waters below, then earth, then air, then the “ceiling” of the sky with water above it and big gates/doors to let the water out. Kinda like this. I’ve always pictured Biblical cosmology that way; it never occurred to me to point out, in evolution debates, the already-accepted un-scientificness of that. I usually think of statements involving the “waters above” as being, not so much figurative expressions indicating something else, but more like background terms that are being used to make a different point (often about God’s sovereignty). “God opened the floodgates” = “God caused it to rain”. Things like that. As for Augustine, yeah. “Literal” when used as a Catholic theology term even now, means “what the author was trying to convey”, which can be not at all what we think of as “literal” today. The non-literal meanings, the “spiritual” meanings, are readings that are even farther away from the literal. So, for instance, the literal meaning of the Exodus story is that God rescued the Jews from slavery in Egypt by parting the Red Sea. The spiritual meaning of the Exodus story is that the parting of the Red Sea is the baptism of God’s people, prefiguring the baptism that Jesus brings. I can’t say I do believe in evolution but I am open to the thought that stories are sometimes used to tell truth and are not untrue because they are not literal facts. The way Jesus refers to some old testament “stories” seem to me to be acknowledging literal truth. I do find this controversy disturbing but my intellectual comfort is not the criteria for discerning truth. The reason that is important is because that is the way the Hebrews and the early Christians read the Scriptures. Another reason it’s important is because in defending the “literal” interpretation of Genesis, Christians have spread hundreds of rumors and falsehoods about science and scientists, making them guilty of slander, some unknowingly and some knowingly. We can deny it, but those unbelievers familiar with the debate know it’s true. It’s a terrible, terrible testimony against the truth of the Gospel. I am mostly interested in evolution because I like science and I like debate. But, like you, I think it’s not super important for Christians to believe it. However, I do think that the creationist movement causes a lot of harm to Christianity; it wrecks our reputation and leads young people and anyone with any respect for science to dismiss Christianity as a whole because they see us as an ignorant, superstitious lot. My neighbor was told by her Christian friends that she cannot believe in God and also believe in evolution. She decided that she definitely believed in evolution. I told her she could believe in both… but who knows how many never hear that? I assume that last line should be “historical truth,” Ruth? Sorry, couldn’t resist phrasing it that way. There is a gigantic conflict between science and some INTERPRETATIONS of Genesis. No avoiding that, no matter how disturbing we find it. I did mean historical truth Paul. Also I somehow deleted the part we agree on which is However God did it He did it and that does give me some comfort. I think the point of Genesis 1, before all the other things we can get out of it, is to announce God as Creator. John 1:3 has the same point. “Nothing was made without him.” That’s the first, most important, and most literal truth of Gen. 1.
well I may be an ignoramous but I find the whole challenge to authenticity of the bible contrasting with authenticity of scientific thought confusing, disturbing and certainly not edifying. I take some comfort in this thought I know you also believe this. What’s really, um … ironic, I guess … is that Brits pronounce it that way no matter how they spell it. It’s a joke to pronounce it “evilutionist” for North Americans, but that’s how Brits pronounce “evolutionist.” I once played a video of a Brit guy discussing evolution, and my kids couldn’t even listen to the commentary because they were giggling at the pronunciation. You lot pronounce it (wrongly) “everlutionist”. I during the summer I saw a friend who has spent the last year studying in the USA. He said at one point “excuse me, I’m just going to use the rest room”. I gave a look of utter disgust before he corrected himself (going to use the “toilet”). > It was really embarrassing. I jumped all over that commenter because I was offended. Had I been correct, I would have been rightly offended. I wasn’t, though, so I was just really rude. Don’t worry about it. It’s a common mistake to make. The big difference between you and most other people is that you went and checked out the stats. You’ve admitted that you were mistaken and that takes a lot of guts. I have this philosohpy that if I debate and lose, I should join the winning side. If I do this enough, I’ll always be on the correct side. I, also, appreciate your honesty. So for honesty on my part, I wish I had remained silent. Today, it seems to me, that secularism is a concern unprecedented historically. So in a somewhat weird turn of events we Christians have to somehow remember first and foremost that Christianity is defined from the center out. That doesn’t mean that the social life complexity and personal life richness in our differences doesn’t matter. But our particularities do matter less on the issue of character formation and on the issue of our engagements in what is a rapidly changing vision of a new public commons( what used to be the public square). The tension within churches is real, but today actions of shalom are needed between us much more as a representation of our faith. One aspect of Christianity that is so important to our service to any culture we find ourselves within is the tranquility that our devotion makes possible. Of course this is but one of others, but it isn’t recognized enough. In a world where everyone is working so hard for success, it’s amazing how many of us believers and non-believers alike realize it doesn’t lead to any peace. You are without a doubt the most honest man I have ever met. And since there are subjects in this world that are just well, … way over my head… knowing a brilliant and spiritual man is of real benefit and comfort. If I can’t understand what is what on any important subject .. I just wait till you figure it out. It is, of course, the Spirit that leads us into all truth… but you … my dear friend … help me understand those truths. Much love… your forever friend.